Carbon 70 is also a form of carbon fullerene; however, it is a bit different from Carbon 60. C70 fullerene is the fullerene molecule consisting of 70 carbon atoms. It is a cage-like fused-ring structure which resembles a rugby ball, made of 25 hexagons and 12 pentagons, with a carbon atom at the vertices of each polygon and a bond along each polygon edge. How did the Carbon Fullerene get its name? 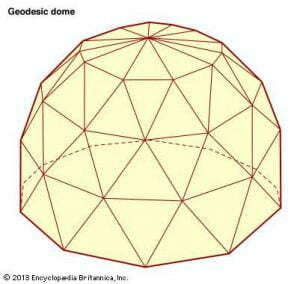 Carbon 70 Fullerenes are named after Richard Buckminster Fuller, an architect who created the geodesic dome. The geodesic dome, which you can see to the right, is a construct that bears remarkable resemblance to the Carbon Fullerenes sphere of C60 in its natural state. However, C70 has a bit of a different structure. Order Carbon 70/C70 from SES Research Today! SES Research is a proud manufacturer and seller of Carbon 70/C70.